Recently updated Marysville master bathroom. Image courtesy of Home Run Solutions. A sponsored article from Home Run Solutions. Are you considering a bathroom remodel? Has the thought of a complex renovation kept you from taking the next step toward a long overdue bathroom update? Are the material choices overwhelming? Home Run Solutions is here to help! 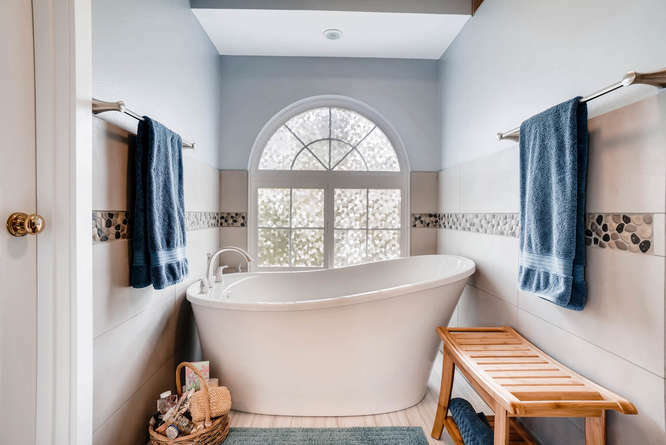 Home Run Solutions is hosting a Bathroom Design Seminar at 7:00 pm on Thursday, March 14th, 2019, at their Mill Creek design center: 16000 Mill Creek Boulevard, Suite 112, Mill Creek, WA 98012. This is the second in a series of design seminars created to educate local homeowners on the nuances of remodeling. Last fall Home Run Solutions partnered with Judd and Black Appliance for a Kitchen Design Seminar. The event was a hit! The Benefits of Working with a Design/Build Contractor. Bathroom Layout and Design Rules of Thumb. Bathroom Solutions You May not have Considered. Insight on the Latest Fixture Trends and Options. Safety and Planning for the Future. There will be refreshments and raffle prizes. There will also be an opportunity for Q&A with the owners of Home Run Solutions (Joe Reed and Jacob Thompson) following the seminar. Seats are Limited and Reservations are Required! Call 425-320-4786 to save your spot! Or follow this link to register online: https://www.homerunsolutions.net. Recently updated Edmonds master bathroom. Image courtesy of Home Run Solutions. Recently updated master bathroom. Image courtesy of Home Run Solutions.